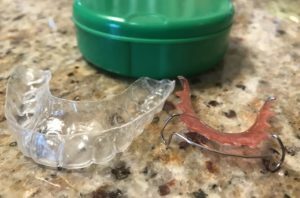 How long do I have to wear my orthodontic retainer? That question, itself, begs another: How long do you want straight, well functioning teeth? Think of it this way … when you plant a new tree, you might stake it up to prevent damage from forces such as wind while the roots develop. When your braces are removed, you really have a whole mouth of ‘freshly planted trees’, and they need something to hold them in place while they adjust to their new location. That’s where retainers come in. There are three main types of retainers. Fixed or bonded retainers, as the name suggests, are wires that are permanently bonded to the teeth. Essix retainers are clear plastic, virtually invisible retainers that are vacuum formed and fit over all of the teeth. 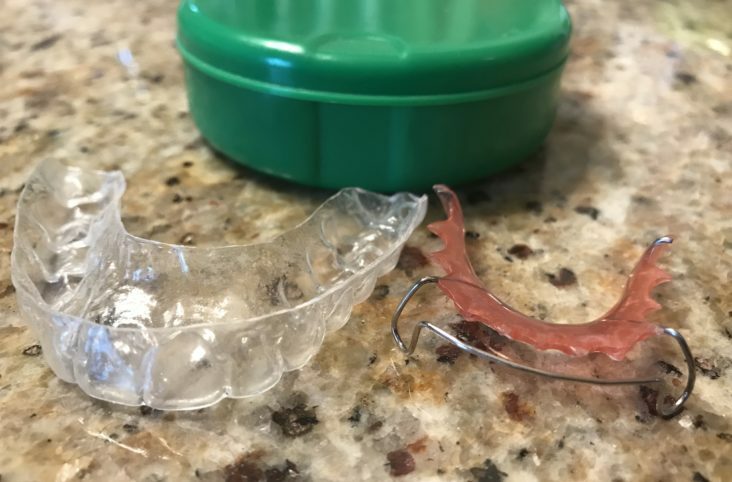 Essix retainers are removable. The third and most common type, is the Hawley retainer. It consists of an acrylic form with metal clasps to hold it in place and a wire that runs over the front teeth. It, too, is removable. Typically, your orthodontist will ask you to wear your removable retainers as much as possible for the first few months, and then ease off until only night time use is required. It can take up to a year for your teeth to become fairly solid. Here are examples of an Essix (left) and a Hawley (right) retainer. So can you stop wearing your retainer then? The short answer to that is no. Your teeth have memory, and will tend to want to migrate back toward their original location. Also, just as braces caused your teeth to move, other forces such as facial and tongue muscles, habits such as thumb sucking, cheek biting, and clenching and grinding, and even further growth can cause your teeth to move back out of alignment. When looking to refer you for orthodontic treatment, whether as a child or adult, you will often hear Dr. Matt and Dr. Meaghan use words like ‘function’ and ‘guidance’. They are referring to a very important part of your overall dental health. Many people think of braces as a purely aesthetic or beautifying treatment, but the real goal is to get your teeth to work together in a way that will keep them healthy for a lifetime. If your teeth don’t fit well and function well together, you face risks such as tooth and jaw pain, tooth fracture, accelerated wear, gum recession, and bone loss. Orthodontic treatment puts your teeth in the ideal place to help them work well together and stay healthy. Wearing your retainers is a small sacrifice to maintain good function AND keep that beautiful smile! Written and submitted by Deb Tretheway, RDH at Pike Lake Dental.